Today was one of the absolute best days! So much great stuff happened! I am only going to highlight some of my day, otherwise this post will go on forever. Seriously though, I am so happy and excited, I could positively burst! Things are aligning so well and opportunities keep falling into my lap. I think the universe is rewarding me for finally getting on the right path and pursuing my passions. Things have never felt so right! I had plans at 9:30 a.m. to meet my friend, Janelle, at CrossFit Pearl for class, but knew I wanted to make another test batch of treats beforehand. I got up bright and early, made some green tea and concocted a new date and nut treat (another potential seller at Cultured Caveman). This one is to die for … salted almond. It sort of has a caramel essence to it and the sea salt brings it all together. 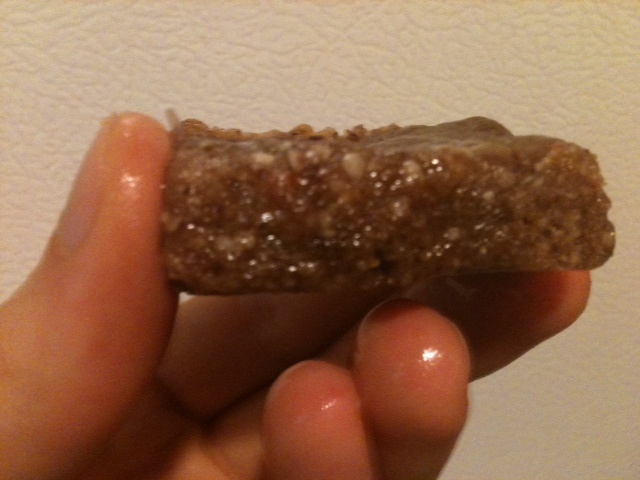 Dates, almonds, almond butter, coconut oil and Himalayan sea salt. I knew with the first bite that it was going to be a hit. I shared some with Janelle, and she shared some with her co-workers, and they all agreed that it was delicious and something they’d buy. Score! Later in the afternoon, I rode up to Cultured Caveman with my most recent samples for Joe and Heather to try (the salted almond, fig/cherry/nut combo, and date/blueberry/cherry combo. They loved the salted almond! Yes, the others are really tasty too, but the salted almond … man o’ man! Anyway, I’ll be following up with them next week to talk about the next steps in our collaboration. As I was leaving, I got a cup of their bone broth to try. Wow, is it ever flavorful, comforting and warming. It made my mouth and body happy. Marrow and knuckle bones cook together in a pressure cooker (I think Joe said for 6 hours? ), releasing nutrient-dense marrow and collagen into the broth. 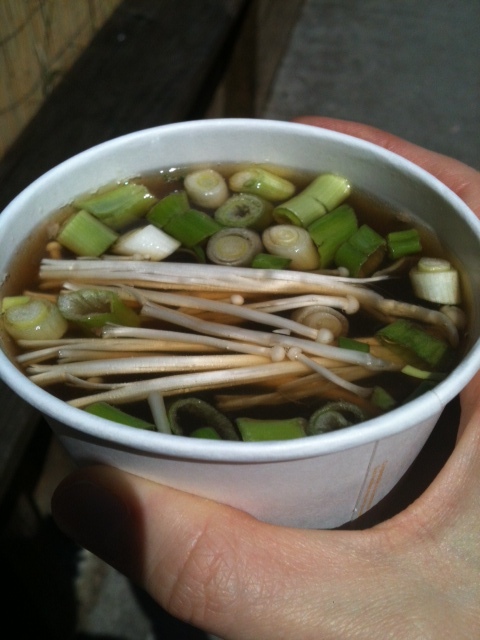 It’s topped with fresh scallions and enoki mushrooms. Delicious. On my way home from the food cart, I stopped at my neighborhood Whole Foods to pick up a few things. 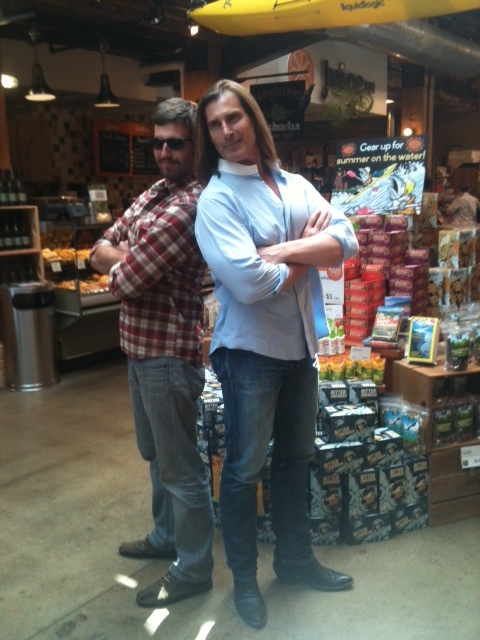 As I walked in, there standing in front of me talking to a group of people is no other than FABIO himself! I definitely did more than a double-take, then got closer to see what in the world was going on. Apparently, he has a new line of protein powders and was at Whole Foods for a promotion. I couldn’t (and still can’t) get over it. Too damn funny! He’s much taller than I knew, and of course is very fit, tan and has a massive, hairless chest! I know this because his shirt was unbuttoned all the way down to the fourth button or so. I wasn’t able to get a photo with him (you had to buy his protein powder to do so), but did get some shots on my phone. People were even getting their protein powder containers signed by him! Goodness, this whole encounter was definitely the icing on the cake for me today. 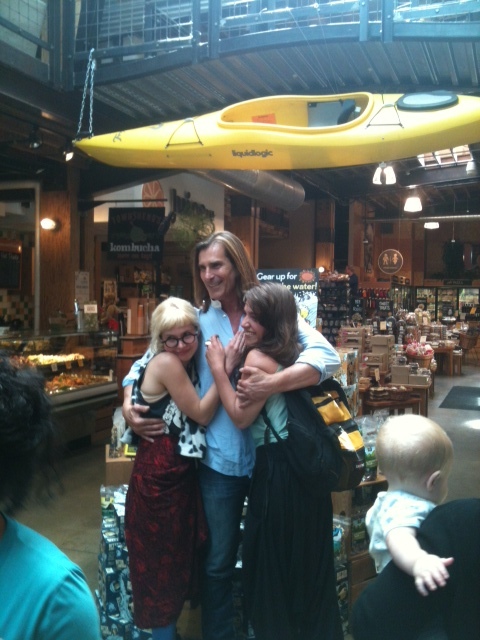 For those interested, he’ll be at the Whole Foods in the Pearl District tomorrow. It’s definitely worth seeing! It seems like he may be on to something better than I Can’t Believe it’s Not Butter. It would be super if Food Front took your treats to sell too. They have a few locally made confections. Ya want me to put in a word with them (I don’t have any special pull there)? Jodi, that is a tempting idea! There’s another chance today since he’ll be at the Pearl Whole Foods, though I don’t think I’ll be making my way down there for anything.